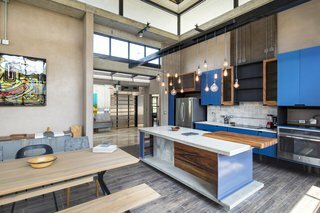 Seeking a place to catch great waves quickly and conveniently, a young businessman reached out to Costa Rican firm NiHu Arquitectos to create a beach house where he could do just that. 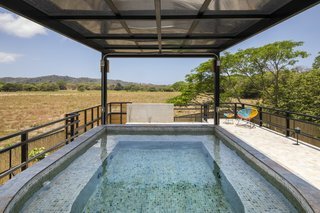 Known as Yellow Door House, the 4,478-square-foot seaside property is located in the popular surfing destination of Playa Guiones, Guanacaste, and sits just four hours from the client's primary home in the city. 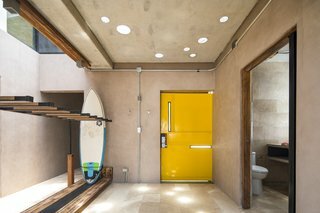 A bright yellow door serves as the main entrance to the vacation home. 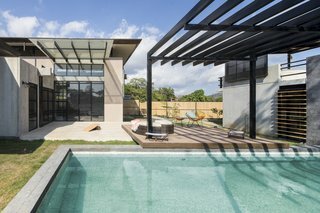 The house features a pool and sun deck on the eastern side of the plot. 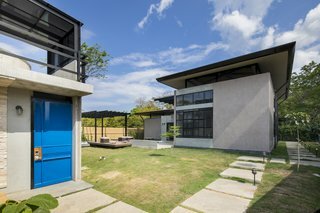 Since the home is on a former rice plantation that has flat, even ground, the architects were able to stretch the floor plan and add a number of outdoors spaces around the three main buildings that make up the house. The team has built ample storage racks for surf boards and other outdoor equipment. "The surrounding geography is very flat and distant. 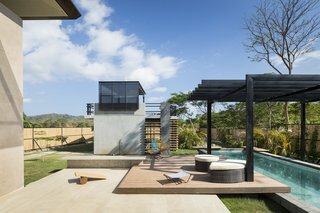 This allows for the exterior landscaping and views to be framed and pulled into the interior spaces as works of art," says Rodolfo Nieto Sarquís, one of the firm's co-founders. 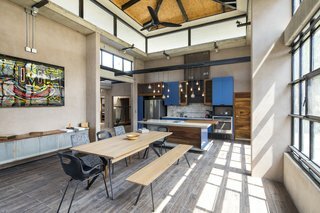 The dining and kitchen area encompass a bright and airy vibe. Bright blue kitchen cabinets reflect the blue of the sea close by. 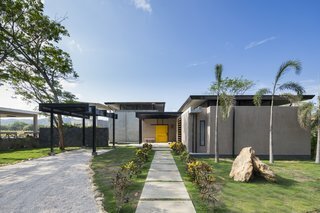 The main house is composed of two concrete prefab buildings that are positioned parallel, but are offset from each other. 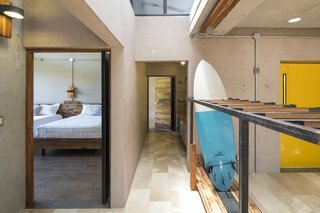 Between two of the buildings is a semi-enclosed area that features a bar, outdoor shower, and storage racks for surfboards. 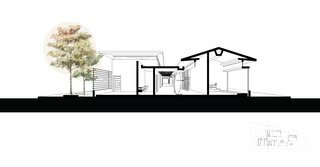 The layout of the three buildings creates a private garden space within the site. One building houses the bedrooms, while the other two feature several social zones. 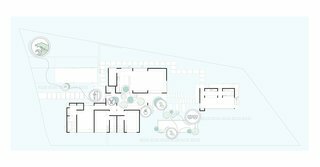 Although this area is shaded with a roof, it opens to the outdoors at both ends to create a circulation plan that seamlessly connects the interiors with the exteriors. Glass walls are fitted on two sides of the master bedroom. 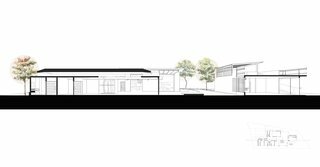 On the eastern side of the plot is a third rectangular building that sits across from the two main structures. 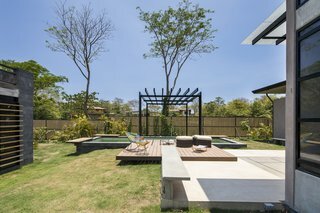 A small private garden area with a pool and sunbathing deck is located between the units. 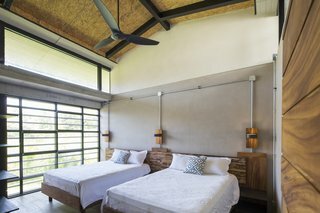 Floor-to-ceiling glass windows help to bring the green outdoors into the bedroom. Concrete slabs form a pavement that connects the outdoor areas to the entryways of the units. 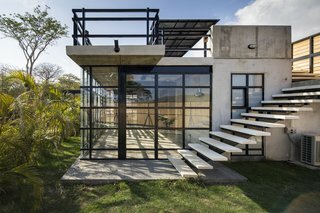 "The result is a patio that runs through the house, allowing for spaces that are easily accessible for the owner and his guests," says Sarquís. 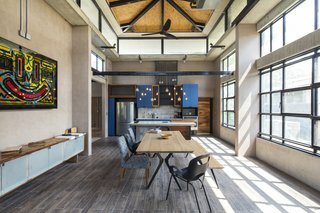 The kitchen and dining area connects to the living room. 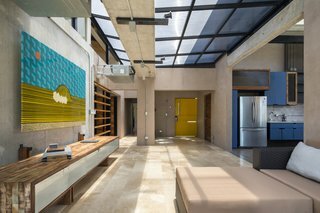 The semi-transparent roof brings much light into the living room. 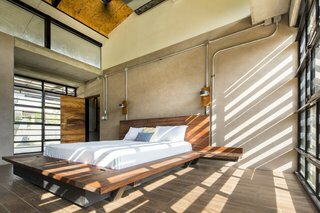 A bedroom with two beds is located in one of the buildings. 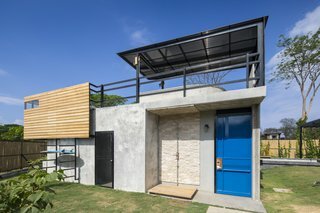 A smaller rectangular building between the two blocks is used as a pool house, as well as a storage area for surfing gear. 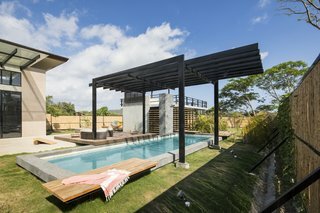 The roof deck features a pergola-shaded plunge pool. There are numerous garden spaces surrounding the buildings. 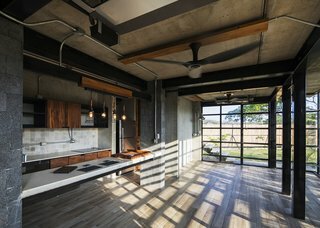 The windows are customized to control the light and air flow in different parts of the property. Another kitchen is located in the smallest of the three buildings. A plunge pool on the roof of the small building makes for a great place to rest and unwind. The pergola keeps swimmers cool on hot days. 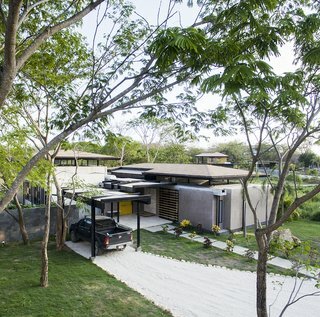 The home features a shaded parking lot near the entrance of the house. The bright yellow door adds a playful touch. 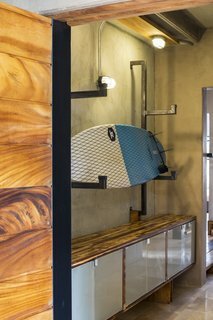 There is ample storage for surf gear throughout the dwelling, infusing a connection between the outdoors. 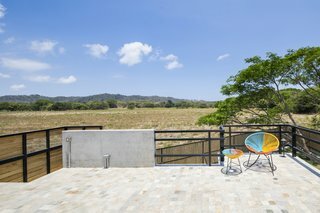 Because the house is sited on a former rice plantation near Playa Guiones, the surrounding flat geography allows for the exterior landscapes to be framed seamlessly from the interior. A look at the floor plan drawing. A peek at the cross sectional drawing.